Pro-Ject Stereo Box review | What Hi-Fi? We like surprises. Little we've heard in hi-fi is as surprising as the scale and power of the sound Pro-ject's diminutive Stereo Box integrated amplifier makes. This amp is tiny, measuring just 4x10x14cm. Yet its claimed 20-Watt-per-channel rating is enough to get just about any price comparable speaker charging along at a decent volume level. The impression of power is helped no end by the amplifier's punchy presentation. Listen to Jay Z's Empire State of Mind and it's the sheer thump on offer that impresses most. The bassline thunders along, with each leading edge sharply defined. There's no shortage of either weight or solidity here. It's tiny, but can it compete? You can add a suitably smooth tonal balance to the list of plus points. Put it all together and you have an entertaining listen. But, as you can guess by the star rating, that isn't the whole story. For all its impressively muscular presentation, the Stereo Box doesn't really challenge cheaper products such as Marantz's PM6003 (£300) when it comes to resolution, dynamic subtlety or transparency. It sounds like a blunt instrument that reveals the basic gist of the track, but never really manages to delve deeper. Soundstaging is a particular disappointment, with the Pro-ject lacking the expansive nature of the best of its price rivals. There are a few practical issues, too. 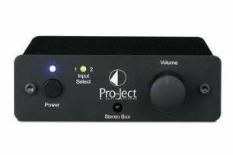 The Stereo Box has only two inputs, both line level. You can add more with an expander box, but that only raises the cost. There are no tape loops, and the remote handset is a poor effort. Practically, the speaker terminals are too close together making it hard to tighten the multi-way terminals satisfactorily. The Stereo Box's ace is the ability to sound about a million times bigger than it is. If you really must have an amp this small, it's worth a listen, but be aware that there are plenty of conventional rivals at this price that deliver an awful lot more.